10 steps in the product development process: Part One - Extreme Telematics Corp.
As consumers, we routinely buy devices that solve a problem for us without really knowing what goes on behind the scenes to get them from an idea on a napkin to a physical product that we can use. At ETC, the product development cycle is more in-depth and time consuming than most because of the nature of our products. It all starts with a customer problem, but as you will see, the path to creating a rugged, reliable and safe product includes a lot of steps and often faces many challenges along the way. It all starts with a single problem. A customer comes to us with an issue where an ideal solution does not already exist. Perhaps there is in fact a solution, but there are several flaws or defects that are just accepted and worked around. As long as the customer is motivated to solve the problem and is willing to pay a little more for a better solution, there is typically enough of a spark to kick off the next stage of the product development process. A new product needs to be novel and add additional value to what’s already on the market. At ETC, we spend a lot of time in advance of the project talking to customers, resellers, and even competitors to truly understand what products are available currently and what is missing. This information is collected and discussed during multiple brainstorming sessions to figure out how we can do things differently and determine any other value points we can provide. It is imperative that we be cautious that in solving one problem, we are not creating others. Building the best all-around product that provides the most value will offer the best chance at becoming the market leader. When designing a new product, it is quite common that one or more core components will involve technology that is emerging or is new to the company. Before moving ahead with development, it is important to have a thorough understanding of these technologies. Typically, reference designs are reviewed, development kits are purchased and the technology is validated well before incorporating it into a product. At ETC, design encompasses a number of different engineering disciplines. Typically, we are involved in hardware, firmware, mechanical and software engineering. Each of these disciplines have their own challenges and processes, which are described at a high level below. Hardware engineering starts with identifying a collection of key components that are required to form the platform at the center of the design. Supporting components are selected, and together a schematic is created that shows the connections between all components. Once the design has been created and reviewed by several team members, layout is performed. This step involves taking the footprints of the physical components as well as the connections and arranging them on a virtual circuit board. Once the hardware has been designed, mechanical engineering will design an enclosure and correlating brackets to ensure that the product is rugged and reliable and can withstand various environmental elements. Other factors that go into the design account for mounting, accessibility, ease of service and manufacturability. Embedded firmware is software/code that is written to run on a hardware platform. This would be equivalent to the software running inside your DVD player or microwave. The software is fully designed ahead of time to ensure that all of the devices are properly supported and that the feature set required by the user is delivered. Once the design is in place, it will be broken up into several components that can be written individually by several members of this team. In most cases, a physical electronic product requires software tools that run on a PC. They are used to program the device or interact with it when in a given mode. Once each portion of the design is complete, it will typically be prototyped. For hardware engineering, this means getting the circuit board printed and soldering on components. For mechanical engineering, enclosures are produced. Some designs will have enclosures that are punched, bent, and welded at a machine shop, while others will eventually require a mold to be 3-D printed at this stage. Firmware can be compiled and run “off target.” This means running a simulator on a PC instead of on the actual hardware. Testing is one of the most critical stages in product development. What good is a product if it does not function as designed? The next few stages of the product development process get increasingly expensive and time consuming, so catching problems now will save time and money in the long run. Even though testing is identified at this point in our product development cycle, there is also development testing, field testing, production testing and regression testing that happens throughout development. Testing should occur during virtually every stage of development to ensure the final product is of the highest quality, is user-friendly and functions reliably. One of the most challenging stages of electronics development is product certification. Even though this stage happens near the end of the product development process, many considerations are incorporated into the design early on to ensure that it will pass certification. All too often users assume that you can simply certify any piece of hardware. In reality it is often much more complex, and most designs will not pass unless very specific design decisions were made. This is why it is important to have an engineering team with specialized knowledge and experience in building hazardous locations electronics. Once the product has been certified, it can safely be installed in the field. Even though this is the first time the product will be installed at a well site, we have simulated conditions such as extreme temperatures earlier on in the testing cycle. By the time we have moved into this phase, we are confident that the product will perform. This phase of testing will help identify situations that were not considered and will put the product in users hands for the first time. At this stage, we are finally ready to mass produce the product, but there is still a lot of work to do. 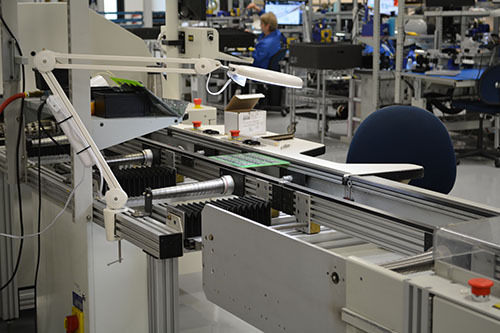 The supply chain has to be set up so that parts are readily available, circuit boards are arranged into panels so that many can be produced at once, machines are programmed, and test setups and procedures are designed and built. Once those things are established, manufacturing runs are scheduled and executed. Once a product is into full production and being used by customers, it has to be maintained. Depending on the complexity of the firmware and software, issues can be found even years after the product is released. A properly designed and maintained device will have updates published on occasion that fix these issues or add new features. Beyond that, hardware components may go obsolete, certification requirements may change, or mechanical enhancements may be required. Check back soon for part two of the blog, which will give you some more insight into how we went through the product development process when creating our plunger arrival sensor, Cyclops.